Executed a buy/write on 300 shares of NITE with a net debit of $14.53. If called away on February 20th I will have a ROIC of 3.1%. My uncalled ROIC will be 4.47%. When I first started my blog I spent considerable time and effort on expiration weekend identifying, evaluating, and presenting potential trades. In addition when I executed a trade I was verbose in explaining each of my trades, how I went about selecting them, and why I liked them. However, as time went on my posts became more matter of fact. I simply presented the parameters behind my trade and at most a little commentary on why I liked it. Well, with this post I am returning to my roots so to speak. This post will give a detailed explanation of what I look for in a potential trade and how I go about conducting my due diligence. So, let’s get started. As you can see my initial search criteria casts a fairly wide net. However, when I get down to finally selecting my trades my criteria are very specific. Let’s look at my first pass criteria a little closer. You’ll notice I choose to not look at any stocks trading for < $10. There are a couple of reasons for this. First, stocks trading for < $10 probably are that price for a reason. But more importantly, unless the stock has options that trade in $1 increments, it is very hard to create a favorable trade in this price range. For example, say a stock is trading at $8.75. The two strike prices available to you are $7.5 and $10. If you choose the ITM $7.50 more than likely your called return will be very small. On the other hand if you choose the $10 strike the stock has to go up by over 14% before you have a chance at being called away. In addition, the premium will likely be very small thus making for an unacceptable uncalled return. You’ll notice I didn’t specify a maximum stock price in my search criteria. I don’t want to limit Scout in this regard. However, it is rare that I’ll do a trade where the stock price exceeds $50. This is because I want to avoid trading single contracts. Rather, I want to trade stocks where I can initially write a minimum of two contracts, three is even better. Thus, my stock price sweet spot is $15 – $30. However, I will go as low as $10 and as high as $50. The reason behind these limits is the overall size of my position. I like to keep my initial entry into a stock at < $5K and my overall position size at < $10-12K. The three other search criteria I focus on are market capitalization, trading volume, and bare cash. I avoid trading small cap stocks, which I define as those with a market cap < $1B. Why? Quite simply because they tend to be more volatile and it is quite easy to have a good trade head south on you in a hurry. I also look at trading volume. Adequate trading volume means liquidity. If something happens that changes my perspective on a trade I want to be able to get out fairly quickly. This isn’t always possible with low volume stocks. Last but far from least, I look at bare cash. This, in my opinion, is one of the most important criteria. Bare cash simply means the company has more cash than debt on its balance sheet. This lets me sleep at night by knowing that if the trade goes against me I’m invested in a company that has cash available to weather the storm and is in no danger of declaring bankruptcy anytime soon. OK, so there you have the basic rationale behind my initial search criteria. Now, let’s look at what my search criteria found this week and in so doing we’ll also look at my second, more stringent set of selection criteria. Below is the Scout report generated by VISIONS using the above screening criteria on the afternoon of Saturday, January 16th. The first and most important thing to realize is that you can’t take the title of the “Scout Stocks to Buy Report” literally. 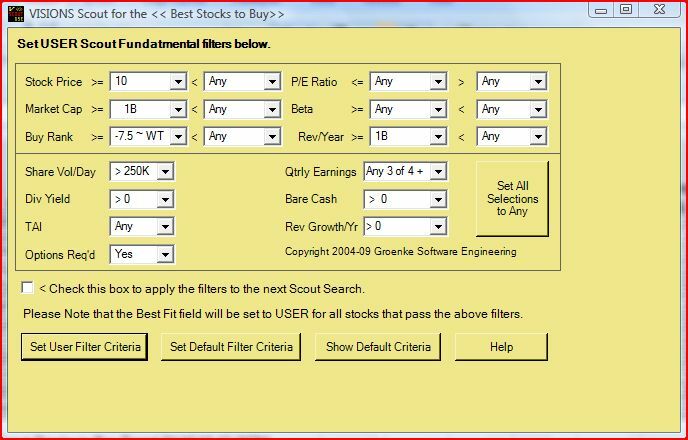 Not all of the stocks presented by Scout are suitable for entering a trade. Further filtering, analysis, and due diligence is required. To assist us in this process I’ve color coded the criteria I focus on. Red is unacceptable, yellow is tolerable, and green is good. For the most part, green values match the criteria Ron Groenke uses in his selection methodology. The first criteria I use to filter potential trades is the TAI. I only want to look at trades with TAI = TA. As you can see of the 10 stocks returned by Scout only 4 meet this criteria. They are APOL, NITE, ESI, and FSLR. Note, of late stocks rated TA have been few and far between. The 9 month run-up in prices since the March ’09 lows severely limited the number of stocks meeting Ron’s criteria. Next up is the Gold$ score. Like Ron, I look for stocks with a Gold$ score > 80. Two of the three variables used to calculate the Gold$ can also be found in the Scout report. They are the number of consectutive up days and the number of days the stock has traded in the V. The third variable is best evaluated by looking at the VISIONS stock chart. We’ll be looking at those shortly. As you can see of the four stocks which passed our first screen only 2 have a Gold$ > 80. ESI’s Gold$ Score is 70, while FSLR has a Gold$ of only 38. You’ll also notice ESI’s closing stock price on Friday, $99.96, exceeds Ron’s buy limit (BL) of $97.18. For these reasons I would eliminate ESI from further consideration. Thus, after looking at two criteria, TAI and Gold$ we are left with two candidates, APOL and NITE. Let’s look at the remaining criteria on the spreadsheet to determine if one or the other clearly is a better pick than the other. 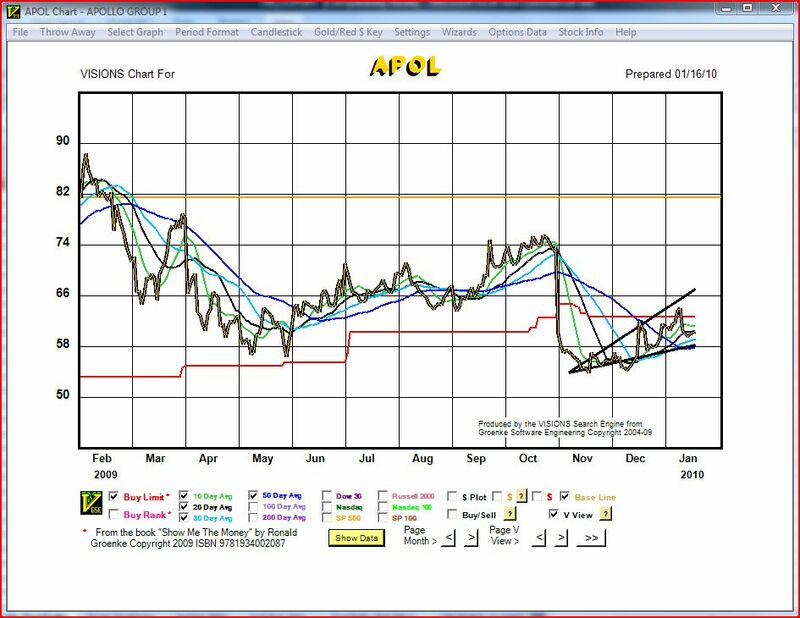 APOL has a perfect Gold$ score of 100 while NITE is right behind it with a 90. How about Bare Cash? Well, both have a goodly amount of bare cash. However, what I like to do is look at the amount of bare cash as a percentage of the stock’s market capitalization. NITE is the clear winner in this category as the bulk of its market cap. is in cash. Conversely, APOL has < 10% of its market cap in cash. The two stocks are tied in the remaining criteria, Best Fit and Quarterly Earnings. So let’s move on to the stock charts and see what they can tell us. But before we do I first want to discuss the price of APOL. You’ll recall earlier I said that I don’t like to trade stocks whose price is > $50. However, in this case I’m willing to make an exception. Why, simply because we don’t have a wide variety of stocks to choose from. With only two stocks meeting our other criteria I’m not going to eliminate one just because it is > $50, especially when it has a Gold$ of 100. Now, on to the stock charts. This is a very good looking chart. Of course, with a Gold$ of 100, I really didn’t think it would look bad. Before making a final decision we might want to determine what caused the huge sell-off in at the beginning of November. I suspect it is disappointing 3rd quarter earnings but we’ll look it up and confirm. Let’s move on and look at our other candidate, NITE. 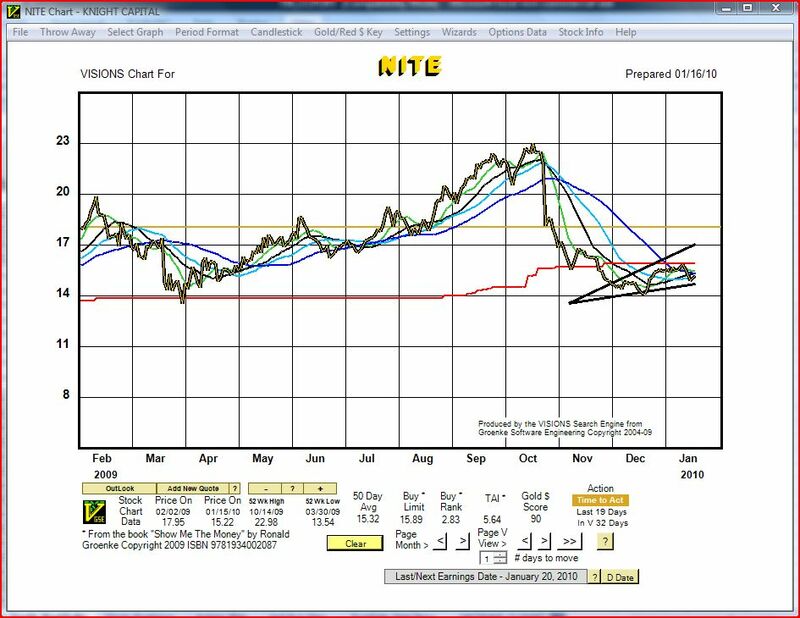 As you can see the chart for NITE is very similar to that of APOL. Like APOL, NITE experienced a significant drop a couple of months ago. And, again like APOL it has carved out a bottom and is beginning to move back up. OK, so looking at the charts didn’t give us a clear winner. Let’s move on and look at some of the Key Statistics tracked by Yahoo. I’ve recorded these in a spreadsheet along with the stats from our other two candidates that we previously eliminated. The one statistic that catches my eye here is the price/book. NITE is a clear winner trading at close to book value while APOL is much higher at over 6 times book value. Again, however, I’m not ready to eliminate APOL from consideration. On to the final step. Let’s look at what options are available to us. In the above spreadsheet I’ve highlighted the near month ATM calls for both APOL and NITE. These are the options that I always look at first. If these don’t appeal to me I’ll then look at near month ITM or OTM options. If I don’t find anything there then I’ll look at the next month out. In this case, the near month ATM calls are not unappealing. I’ll take a closer look at them. It is clear that the APOL options are the better choice. They have a superior called and uncalled return. In addition, they also give superior downside protection. So, after all of this analysis what am I going to do? Well, based purely on the numbers reviewed in my analysis I believe APOL is the better trade. However, remember I don’t like to trade stocks priced above $50. Thus, I am inclined to select NITE as my next trade. Now, you’ll recall I also placed a trade in NITE last month. It finished ITM so I should find that it has been called away when I log into my account tomorrow. Thus, given my familiarity with NITE, it is one more reason that I’m inclined to choose it over APOL. That concludes my analysis of these potential trades. I hope you have found this to be worth your time to read. I’ll be back tomorrow with another post updating everyone on how my January trades turned out. GMEs earnings announcement today presented me with a great opportunity to expand my position. The stock sold off hard at the opening bell diving over $4.50 to trade as low as $19.42. In seeing this big drop I did a quick read of the press release to ensure nothing was fundamentally wrong with the company then I started looking at puts. My first look was at the JAN $19 puts. However, with only 9 days to expiration it had little to offer. It was priced at $0.35 bid. That wouldn’t do. What I was looking for was a put that had enough premium that when the bounce I was expecting came I could buy it back for a quick profit. Next up, the FEB $19 put. Now here was a put I could like. It was at $0.85 bid. This was the one I wanted. So, now knowing what I wanted to sell I began to closely watch the stock trade. I was wanting to sell the put at the point of maximum pessimism. This is something that, with practice, you can begin to sense and see in the trades. The trick is in having the courage to pull the trigger when that point comes. So many times in the past I have chickened out when the exact moment arrived. Not today. I pulled the trigger and sold 3 FEB $19 puts for $0.95. Believe it or not, the stock almost immediately began to turn around. Less than an hour later I could have bought my puts back for $0.45! Did I? No, I did not. Why? Well, partly because I was being greedy. Of course, the stock then bounced around the rest of the day and I didn’t get another chance to buy it back. However, it looks like I might have another chance tomorrow as the stock was up in after-hours trading. OK, so by selling the FEB $19 puts what did it do for me? Well, first off I am getting a 5% ROIC on my cash secured puts (0.95/19). 5% in 44 days to expiration is 41.44% annualized. Also, if I’m successful in buying the puts back at a steep discount to my sales price or if I hold them and they expire OTM I will have significantly reduced the net cost of my existing long stock and short call position. You’ll recall I bought the stock on 12/21 at $22.65 and sold the JAN $22.5 call for $0.96. That makes my net cost $21.69. If I’m wrong and GME continues to sell off and I end up having the stock put to me at $19 I still am in a good position. My net cost on the new position will be $18.05. I’ll then own 500 shares with a total net cost of $19.51. Here you go Rich. Here’s the thread for you to post your trades this month. Hopefully others will start joining you and post their results here as well. UPDATE: Note, I have updated this post from its original contents to correct errors I found in my results spreadsheet. My apologies for any inconvenience or confusion this may have caused. Well my first full year of CC/NP trading following Ron Groenke’s approach and using his VISIONS software is complete. What a year it has been! First we suffered through one of the most volatile periods in history and the accompanying drop in the stock market. Then we experienced the most explosive recovery in the history of the market. How did I do? Well before we delve into those details let me say that I was very conservative in my trading this year. I only did trades where I felt the odds were overwhelmingly in my favor. 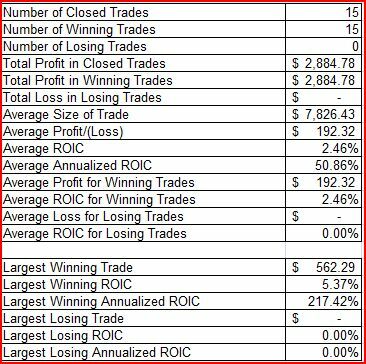 This is evident in my results as I did not have a single losing trade using Ron’s approach. My conservatism is readily apparent in the metrics presented below. 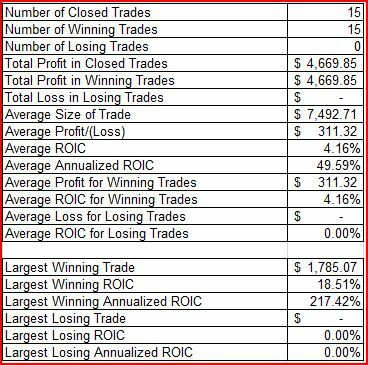 I only entered and closed 15 trades using Ron’s methodology. However, all 15 of these trades were profitable. Another indication of my conservatism can be found in the size of my trades and the average profit generated from them, $7492.71 and $311.32 respectively. Yet another indication of my conservatism can be found in the fact that 12 of my 15 closed trades were cash secured naked puts that were for the most part deep OTM. Clearly, if I want to achieve my long-term investing goals I will need to greatly increase the number and size of my trades. However, going forward I don’t think this will be an issue because my results this year have given me even more confidence in Ron’s approach and the power of his VISIONS software.